Hardeep is a much respected and award winning broadcaster, comedian, writer and chef. Hardeep also sits on the Board of the National Theatre of Scotland. He can be heard on BBC Radio 4, including shows such as Hardeep's Sunday Lunch and Pick Of The Week on BBC Radio 4. He has also regularly fronted programmes for BBC Radio 2, BBC World Service and BBC Asian Network. Hardeep was a presenter for TalkRadio in the UK and he is also a regular on BBC1's Sunday Morning Live conducting interviews with Maureen Lipman, Nigel Benn and Lord Putnam amongst others. He is a regular on Channel 5's The Wright Stuff as both a panellist and guest host. Hardeep currently writes weekly columns for Sunday Herald and The New European. He has also written and presented a number of documentaries for Channel 4 and wrote, directed and starred in Meet the Magoos and has contributed to many major publications including The Observer, The Spectator, The Times and The Independent as well as being nominated for ‘Travel Writer of the Year’ at the AITO Awards for his piece in BA High Life. 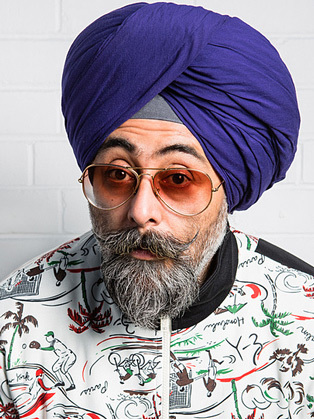 Hardeep is also an experienced comedian who tours the country and sells out runs at the Edinburgh Fringe.